The traditional approach to understanding plant chemicals has been to classify chemicals as primary and secondary natural products. Primary natural products are those that relate to chemical pathways normally covered as a part of biochemistry, such as the Kreb’s Cycle, glycolysis, gluconeogenesis, nucleic acid synthesis, and amino acid synthesis paths. Secondary pathways are interpreted as everything else that is not primary. This includes some basic metabolic pathways like oligosaccharide and even polysaccharide and protein synthesis along with some more specialized pathways leading to the generation of compounds not common to all species. Secondary paths are those which lead to the development of secondary natural products. Examples of secondary natural products include the some of the most basic chemical components of plants that we don’t normally consider primary metabolic pathway end products like the phytosterols beta-sitosterol and ergosterol, and chemicals very unique to some plants like the plant alkaloids caffeine and nicotine. Generally speaking, secondary natural products have such variation in chemical structure, functionality, environmental and ecological histories, that this broad group requires another way of interpreting its long list of chemical classes as well as their various functions and applications metabolically, environmentally and ecologically. Another way to define plant products, both primary and secondary, is to define these chemical groups based upon their purpose or role in plant metabolism, and the related plant survival and plant environmental and ecological mechanisms. This method of reviewing plant chemicals provides us with one more way of better understanding the chemical pathways that exist in plants and their end products. The end products of a phytochemical pathway are there for a reason. The traditional point of view has been very neo-Lamarckian in nature. This point of view states that through partial intent and partial lack of intent, plants synthesize a chemical or initiate and series of chemical steps needed to produce a new compound in order to result in a vast array of end products. These new end products in the cell, the tissue, the organism in turn have an effect on the plant’s ability to survive in its current habitat, especially when that habitat is changed environmentally or ecologically. The Darwinian point of view then comes into play in that its proponents claim the given plant has developed these new paths and vast arrays of chemical complexity due to some inherent genetic traits possessed. This dualist theory for phytochemical evolution seems to satisfy both ways of interpreting the plant cell and its way and reasons for becoming productive in one or more special ways. The typical dualist phytochemist will tend to begin the argument by searching for some unique differences a plant has when it is found living in a specific place, chemical differences related perhaps to a unique chemical group of compounds, a new highly specialized product developed as some form of adaptation to the new setting, or a new series of compounds related to the needs of specific local co-residents of that ecosystem, such as herbivores or herbiphiles. Once the unique chemical features are found in a given environmental setting, the phytochemical dualist then begins to focus on the ways and reasons these new chemicals were formed. Now the Darwinist approach is taken, and specific phenotypes and genotypes are then researched to see if the ways in which these new end products were produced can be defined. 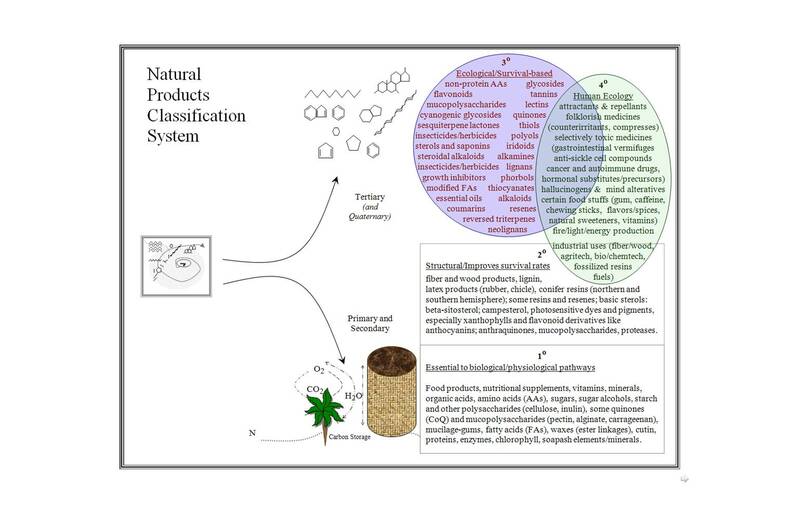 This dualistic approach to studying phytochemicals, in particular from the neo-Lamarckian point of view, benefits us if we take a closer look at all of the neo-Lamarckian features that may exist for a given plant and it various classes of chemicals. By combining the knowledge of chemical pathway related mechanisms with traditional chemical classification methods, as well as with some traditional utilitarian methods of subdividing chemical into groups (dyes and pigments, fats and oils, resins, gums, etc. ), we can come up with a more concrete way of dividing phytochemicals in various large groups helpful in defining how to best research and evaluate these compounds. Level 2–secondary products, serving a purpose mostly at the organismal level, such as a genetically self-engineered mechanism for producing a new primary metabolic end-product. Level 4–secondary products, serving a purpose mostly at the ecological level; improving a species’ chances for survival within the given ecological setting, meaning that interactions with other life forms is a part of the mechanism by which these chemicals work. Another way of interpreting primary and secondary products is to focus more on their overall purpose and utility. This method of interpreting chemicals places them in the following four categories, defined based on humanist interpretations of the plant’s value. The Secondary natural products in this system are subdivided further based mostly on organismal, environmental and ecological lines of reasoning. Primary–primary metabolites, as above; and perhaps some secondary products that serve solely the organism at a cellular, physiological and organismal level, without impacting other species or neighboring plants. Secondary–secondary products as above, produced mostly for organism/self-targeted cellular to organismal survival benefits (mostly physiological, but some structural); developed in relation to local environmental stresses, resulting in improved chances for survival. Mechanisms work by providing an advantage over neighbors in terms of survival, but demonstrate only passive mechanisms for increasing the chances for survival, such as the addition of a new photosynthesis chemical or development of a new method for manufacturing a structural fiber component. Tertiary–secondary products, focused on natural ecology and evolution survival mechanisms; these compounds demonstrate passive and active developmental and survival-related mechanisms, such as the production of a growth inhibitor for other species or the development of antifeedants. Quaternary–secondary products, focused on human ecology mechanisms; involves compounds that may or may not have ecological purpose aside from human use. The above two ways of classifying phytochemicals ask similar questions about phytochemical evolution, but from different points of view. Levels 1 through 4 look at the biological, environmental and ecological relatationships between survival and chemistry. The Primary to Quaternary classification method extends us beyond the classic secondary natural products way of grouping plant compounds and is very human based and utilitarian in its concepts. It focuses on the human evolution of plants separately from natural evolutionary traits. Another major difference in these two ways of grouping phytochemicals is the underlying advantage at times of one over the other. A single chemical class such as a phytosterol can be interpreted as a Levels 2 through 4 chemical or a Secondary, Tertiary and Quaternary chemical group. The first allows us to argue that some basic sterol building blocks are Level 2, which are modified to produce some Level 3 products–offering the plant an advantage sue to some physical, environmental features, as well as to produce mostly Level 4 interactions–sterols that serve mostly as protectants such as saponin-related mollusc antifeedants and emetotoxic sterol alkaloids. Using the Secondary to Quaternary method of interpreting these same products, we have some secondary products like the basic fairly non-toxic and ubiquitous sterols, some tertiary products such as the molluscicides (saponins) and emetics (called emetotoxins above) that serve to prevent feeding behaviors, and the quaternary application of the same chemicals as intestinal antibiotics and cardiotoxins serving as potential heart drugs. These quaternary applications were not evolved for us to make particular use of. They came about due only to recent progress and discovery and are completely human ecologically based. The Level 1 through 4 method doesn’t distinguish between man’s influence on plants and how this impacts the survival of the plant. The primary to quaternary system of chemical and use classifications does. Consider for example the following chemicals classes and the slight differences in these two classification systems related to chemical purpose. modified for use in structural features related to environmental stressors, like the development of a high temperature resistant leaf wax by Arceuthobium spp. (mistletoe) and allies. Quaternary–fatty acids modified to produce cyclic fatty acid chemicals with specific human use; often the same components as tertiary, but with human ecological use different from natural ecological use. amino acids/protein storage in seeds; some structural integrity uses for proteins may exist as well. Quaternary–human related selective toxicity of N-compounds is the focus. N-agents serving as bitters for food and for use as human antifeedants. Applying all of this to ethnobotany, ethnopharmacology, or phytochemical research, the goal of the research typically defines the primary approach that is taken. A bioengineer interested in finding and then developing a new series of plant-derived chemicals with specific uses in mind will first usually focus on the chemical approach, followed by an ethnobotany and/or ethnopharmacology approach to sifting through the information that is out there. Using my own past research project as an example–the study of benzylisoquinoline (biq) pathways and the synthesis of unique toxins via this secondary metabolite pathway for potential applications to medicine, in particular cancer drug utilization–my approach began with the mapping of biqs in terms of genera, and where these genera were found taxonomically. I then developed a system for analyzing the chemical features of each chemical, along to taxonomy-evolutionary tree, to define what specific changes were taking place as these chemicals evolved along these paths in terms of phytochemical synthesis. The next phase of this work was evaluating the ethnopharmacology of these chemicals, by looking each and every one of them up in the Chemical publications, the chemical archival sources out there, the various databases and Chem Abstract Indices, by species, common name and chemical name back to the 1800s. Next the species discussed for each chemical was review, and an overall ethnobotany table develop defining the uses of each of these in detail to determine if there were certain repetitions in practices that stood out. Finally, the review turned to Index Medicus and its similars (nothing was at all electronic or the web when I started this), and came up with some conclusions regarding where next to go. If I were interested in bioengineering this plant, I would then have to turn to Biological Abstracts and repeat the same process. This very specific method of tracing the chemicals is extremely time-consuming, but thorough. Its disadvantages (reduced somewhat by the current technology) related mostly to aggregating the information well enough to define the next steps to be taken for this type of research. Once all of this information is accumulated, we still have to determine a way to go. The goal of finding a cancer drug is very specific, which means that the primary to quaternary way of interpreting the data was essential from the start. We need to place less emphasis on the primary and secondary features (as I define secondary) and place more emphasis on the tertiary and quaternary roles these chemicals might play. I expect cancer drugs to have some sort of ecological reasoning for their existence, and for this to be mostly related to antimicrobial or some other antibiotic effect. I also do not expect to learn about any specific “cancer” treatment methods as noted in historical ethnobotany or medical botany pieces, unless that work was published after 1960 and does not rely upon earlier references for this intellectual pursuit. The logic I used for cancer drugs was fairly basic. Some drugs evolve as evolutionary consequence related to ecological influences. Other cancer drugs that are truly chemotherapeutic might also have absolutely no ecological component to their evolution. Their evolution and Level 4 anticancer trait is solely a consequence of human biology and the method in which the chemical was applied. Whereas a chemical drug like epipodophyllotoxin, for example, has a possible antifungal, tertiary feature, serving top protect the inner bark of a Calocedrus, the discovery the same or similar chemical in another plant existing elsewhere in the world, will have a totally different niche that it fills in the ecology and will have developed this chemical for totally different reason. For this reason, the podophyllotoxin found in Podophyllum species in North America and India have identical evolutionary reasons perhaps for existing, but features that are very different for their chemical that Calocedrus has for its own. For both Calocedrus and Podophyllum, the toxin is produced for the same Level 4 reasoning, and has the same quaternary degree series of human ecology related applications. But the Level 4 ecological involved different evolutionary pressures generated by the two completely different environments. Podophyllum is from a group of plants more adapted and evolved from the tropical to temperate setting, the Calocedrus toxin evolved during a prolonged period of exposure to the arctic to temperate zone setting. As an ethnobotanist, my method of reviewing plants and their chemicals are going to be very different. My focus is on plant identification and use, within a given cultural setting. My concern for human-related interactions with plants is focused more on the anthropological components of this feature than the high scientific chemical and structural components related to my research. My goal may still be the same–to find the next cancer drug–but my method of exploring this has to be completely different. The first issue to be resolved is once again, what are the Levels 2 and 3 components of whatever plants I learn about during my ethnobotanical knowledge pursuits, and what tertiary and quaternary (natural and human ecological) features stand out for the plants I am learning about. There is also this cultural component of this latter question that has to be taken into consideration. Whereas some countries include deep scientific thought in their lines of reasoning for the use of plants, many cultures use less scientific, more experiential and more philosophical methods of designing and maintaining their highly specialized plant uses. Cross-cultural definitions is the first problem to deal with–is the “cancer” you are inquiring into and asking about the same form of “cancer” pathologically and biologically as that defined by the individual being interviewed or questioned? It would be very unusual for the answer to this question to be ‘yes’ at least at some direct level. We expect to see cases where more advanced mechanisms are in place for making the diagnosis of cancer in the true sense, by some lab that services the cultural setting you are in, or by some program in place that is designed to analyze and diagnose those “cancer” cases in a fairly credible way. Usually, looking at cancer drugs by way of this research route is going to be filled with some very time-consuming practices. One usually has to revert to the method first employed–reviewing Chem and Bio Abstract, Index Medicus, etc., after all of that anthropology research work has been done. This method is also in use today to research plant drugs, but usually a team of researchers is involved in this type of process, employed for complete long-term evaluations of plant uses, often funded by fairly sizeable research grants. The other way to go with engaging in ethnobotany research is more a grounded theory type of approach. First you collect and tabulate all your data, then you engage in some sort of methodological analysis of the data provided, by classing and subclassing in different ways, searching for specific patterns to emerge, like the same use for different Cyperus species or the recurring theme of a particular medical use related to a specific ecological setting or a specific plant form, appearance or taxonomy. This method allows for some analyses to then be made, quantifying your findings based on simple statistical methods (i.e. 2×2 Chi Sq). What the outcomes of this method of analysis tell you is what to expect if you continue this line of research and information gathering, and how to begin developing a method to quantify outcomes across different settings, involving different cultures. Notice this latter method has not yet taken and scientific approach other than through the use of statistics. We have not initiated anything to do with the chemistry of a plant. The only pure science method employed in this work might be the use of Latin names to identify the plants and to identify their taxonomy. This way correlations can be made in terms of biological features to some extent. Otherwise, the anthropological approach is the focus of this method of ethnobotany evaluation. Since statistical measures were incorporated into the above methodology, we have to keep in mind the problems that total N (total numbers of plants reviewed, or total numbers of cases/interviews/healers/plant uses) can cause. Low N (<45 usually) can cause problems in this research approach, and since these reviews are often involving small groups, this can be a fairly frequent and recurring problem, unless the measures being made are designed to be well above this minimum value. This method employs all levels of plant use, and focuses on quaternary features. The tertiary features of the plants being studies should probably be reviewed a little as well, but are not a necessary component for this particular kind of research. Were a pure scientist such as a plant chemist to follow-up on your findings, we would expect he/she to engage in the more scientific process noted above, before engaging in the chemical extraction and physiological testing process ,attempting to define whether or not there is an actual medical or pharmacological effect of the plant being tested. As an example of a grounded theory application of this latter method, let’s say you have to research plants uses for a particualr cultural group. You find out they use 100 of the local plants out of a total of 800 that you counted to be in the immediate vicinity. So next you document, review, and tabulate your results. The tables tell you they have specific uses for specific plants, in such a way that perhaps this can be statistically validated. So, you apply this technique to the overall project, and find that certain fiber plants grow adjacnnet to the streams and swamps, and that food plants behave according to the null hypothesis overall, but show a tendency for field crops to be sources for fruits and vegetables according to your numbers evalautions. Next you want to try to link these uses to particular environmental features, which you decide will be zoologically focused. Your hypothesis is that if there are some plants that are attached to natural ecology, they will know this at some level, by one or more members of the community, especially those most attached to these particualr plant uses. So you come up with a series of ecological questions based on the local animal life, ask people these questions, ask them to define a particualr degree of correlation that they feel exists between certain plants and certain animals (Likert scale perhaps), and then quantify the results of this work. Unknowing we might find that some plants most heavily used had a correlation with hunted animals, and others with specific insect related ecological associations which they have. Even though no direct connection could be established between termite mound activities and the use of plants related to termite activities, this correlation is statistically found. Sometimes there is an underlying history that may be missing from the project at hand, in which case this method could help a researcher to uncover these missing bits of data. Not too surprisingly, you might also be able to quantify the age-gender-social group-ethnobotany activities relationships to a certain extent, relating certain plant use practices to certains needs and groups of people.